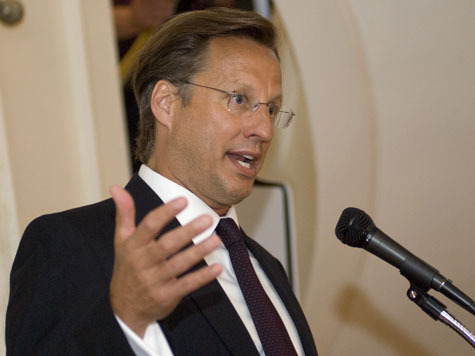 GLENN ALLEN, Virginia–Conservative talk radio host Laura Ingraham campaigned here with the long-shot primary challenger to Majority Leader Eric Cantor, Randolph-Macon economics professor David Brat, issuing a blistering attack on Cantor’s immigration record. At an evening rally at the Dominion Club attended by roughly 500, Ingraham and Brat showed no love lost for Cantor, who has been touting himself as an anti-amnesty warrior in campaign literature. The rally is another sign of the volatile political climate Cantor faces back home, even as he is poised to be the next Speaker of the House when its current holder, John Boehner, steps down. Cantor, although known for pulverizing even empty suit opponents, has taken a number of unusual steps to keep the Brat threat at bay, including the anti-amnesty literature and negative television ads criticized by fact-checkers as misleading. Even still, Cantor is widely considered safe from any real danger of losing, and Brat has been vastly outspent over the course of the campaign so far. The rally was dominated by discussion of Cantor’s record on immigration, highlighting his support for legislation to grant amnesty to individuals brought to the country illegally as minors and in support of the House GOP’s immigration principles that call for legal status, but not citizenship, for millions of illegal aliens. “I have this crazy idea, as does Dave Brat, that coming to our country, respecting our way of life, our laws, is a condition precedent to your becoming an American citizen,” Ingraham told the enthusiastic crowd. 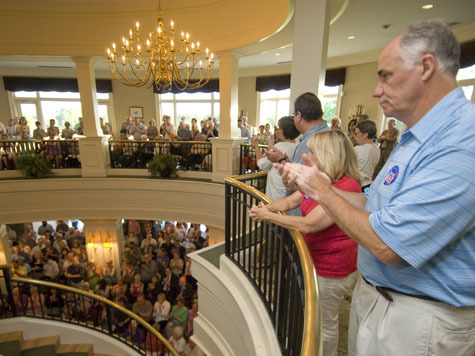 “Who do you think Barack Obama and Nancy Pelosi want to win this primary?” she asked the crowd. Ingraham poked fun as what she called the “theater” of Representative Luis Gutierrez’s (D-IL) recent press conference in Richmond where he criticized Cantor for his “so-called” opposition to amnesty. Ingraham noted the huge financial disparity between the two campaigns. “Eric Cantor is spending hundreds of thousands of dollars with the help of big business, the Chamber of Commerce, and other huge interest groups that have a vested interested in opening up our borders,” Ingraham added. According to reports filed with the Federal Election Commission, the Cantor campaign spent $1.9 million between January 1 and May 21, while the Brat campaign spent only $123,000. By the end of the primary, Cantor is likely to spend close to $3 million, while Brat is unlikely to have more than $300,000 to spend. Ingraham then introduced Brat, who continued the relentless attack on Cantor over immigration. “There’s no deal he won’t cut, there’s no arm he won’t twist to deliver… low wage jobs to you …in exchange for cheap labor. That is no deal,” Brat said. “A vote for Eric Cantor is a vote for open borders. A vote for Eric Cantor is a vote for amnesty. If your neighbor votes for Eric Cantor, they’re voting for amnesty, and they know it,” Brat added. Brat continued on his theme that Cantor is representing the business interests of the U.S. Chamber of Commerce, not the people of Virginia’s 7th Congressional District. “A vote for Cantor is a vote to sell America to the highest bidder,” he said. Over the course of his career, Cantor has generally gotten high marks for his immigration votes from anti-amnesty group NumbersUSA and has opposed the Senate “Gang of Eight” bill. In her earlier remarks, Ingraham also emphasized the importance of maintaining the American “can do” attitude, something, she said, Eric Cantor no longer represents. “By the way, what are the first four letters of Eric Cantor’s last name? Just a question for the crowd,” she said, to the laughter of the crowd. All photos by Duane Berger.